Gale-force winds have shuttered the island's airports and covered the old road sign with a thick crust of snow. Out here, on the back side of the Langjökull glacier, even our navigation system doesn't work. So, trusting little more than instinct and some fresh tire tracks, we keep moving towards the rift valley where the Mid-Atlantic Ridge is slowly tearing Iceland apart. Finally, we spot the rest of our group. There's just one problem: a fast-moving river separating us from them. The easy way would be to drive to the nearest bridge. That would also be the slow way, adding an hour or more to the journey. The alternative? To dive or, rather, drive right in. Of course, it helps to be sitting behind the wheel of the new Land Rover Discovery Sport as we navigate our way across Iceland and terrain so barren it was used as a backdrop for some of the most desolate winter scenes from the popular cable series, "Game of Thrones." With its automated Terrain Response System we can quickly set the "Disco" up for whatever sort of situation we might encounter. The Snow Mode automatically adjusts an array of vehicle functions, including suspension, throttle, brakes and transmission, to increase grip and handling. There isn't a setting for "Underwater," but the big SUV does offer a full 8.3 inches of ground clearance and an impressive 23.6 inches of wading depth. It's close; the frigid waters come up to within inches of our windows, but we're soon scrambling up some ice-covered rocks to rejoin our colleagues. When the Discovery Sport was first unveiled last September, Phil Popham, the since departed marketing director of the Jaguar Land Rover Group, said it came at "a pivotal moment in the 66-year history of Land Rover." It was more than just some marketing hyperbole. A decade ago, Land Rover was little more than an afterthought for most SUV buyers. Its viability became more questionable when, in late 2006, Alan Mulally became the CEO of parent Ford Motor Co. With Ford facing serious financial issues, the former Boeing executive decided it was time to focus on the company's core brand, often called the "Blue Oval." That meant doing a complete 180 on a strategy laid out under Mulally's predecessors, jettisoning a collection of European luxury brands once expected to generate a third of Ford's global sales—and an even bigger share of its profits. As part of Mulally's new "One Ford" strategy, Land Rover was sold off in 2008 to India's ambitious mega-conglomerate, the Tata Group, and combined with another British Ford brand, Jaguar Cars. Considering Tata's automotive group was best known for developing the world's cheapest automobile, the $2,500 Nano, it was an odd fit, indeed. Plenty of skeptics predicted the new Jaguar Land Rover would vanish onto the automotive rust heap, along with once respected British brands like Triumph and MG. But conventional wisdom has a way of being wrong. And while it's far from certain that JLR will pull off a comeback, there are plenty of reasons to believe momentum is moving in the right direction. The Land Rover side of the company traces its roots back to 1947, when Maurice Wilks, the engineering director at the old Rover car company was taking a vacation along the British seaside. On a whim, he sketched the shape of the company's original SUV in the sand, later proposing his idea to his brother Spencer—who just happened to be the company's managing director. The original Defender model came to market a year later. The Jaguar side of the company was the brainchild of Sir William Lyons, one of a cadre of creatively eccentric British auto entrepreneurs. It was founded in 1922 as the Swallow Sidecar Company, originally focused on motorcycle sidecars. It soon shifted to automobiles and, following World War II, changed its name to Jaguar to avoid the awkward connotation of its SS initials. Like Land Rover, it went through a series of mergers before being nationalized in 1975 as part of the poorly managed British Leyland. Former Jaguar executive Mike Dale once recalled how company veterans raced to hide trophies and models from the new government managers who allegedly planned to have them melted down for scrap. Jaguar was broken out of British Leyland in 1984 and, in her final years as British Prime Minister, Margaret Thatcher decided to auction it off. Ford won the bidding war, taking control in November 1989. Considering their precarious finances, Ford seemed the ideal parent for both British brands. And, indeed, it quickly pumped billions into the two operations, only belatedly realizing they were both in far worse shape than anyone at the U.S. maker had imagined. Jaguar's ancestral assembly plant was decades out of date, recalled former Ford vice chairman Allan Gilmour. Its product line was in equally dreadful shape. The situation was only slightly better at Land Rover thanks to hefty spending by BMW. But the two brands also paid a price for Ford's largesse, as the ill-fated Jaguar X-Type revealed. "We had to fight to get our share under the Ford portfolio," noted Gary Temple, who headed Jaguar Land Rover North America after the two brands were sold off. The compact sedan might have carried a luxury badge—and commanded a premium price tag—but many of its basic components were the same parts found in mainstream Ford models going for half the price. The compromises were far too obvious to potential buyers and the X-Type, along with other Jaguar models, failed to come close to Ford's lofty sales forecasts. By the time Ford CEO Mullaly took over, it was clear that neither company was going to meet expectations without billions more in subsidies, money Ford simply didn't have as the worst economic recession in decades threatened the collapse of the entire U.S. auto industry. Tata, fueled by India's booming economy, was fairly flush with cash. Founded in 1868 as a trading company in Bombay, it today owns operations in the airline, chemical, beverage, steel and telecomm industries, among others, and it's making a big push into automobiles at a time when many industry experts believe India could eventually become the world's second-largest automotive market, behind China and ahead of the U.S. While Tata Motors focuses on cars from India's emerging masses, it sees JLR as an opportunity to push into the high-profit, high-visibility global luxury car market. It also hopes that its British subsidiary can provide engineering know-how to move beyond the primitive Nano, which is little more than a rickshaw on wheels with an annoying tendency to catch fire. Tata got a relative bargain when it purchased Jaguar and Land Rover, spending barely $2 billion—a fraction of what Ford paid just to buy the two companies. But bringing them up to competitive strength hasn't come cheap. According to various reports, the Indian parent is investing at least $3 billion annually for new products and factories, "further evidence of our commitment," suggests JLR CEO Ralf Speth. In March, Tataannounced it would invest another £600 million, or nearly $900 million, to double the size of JLR's headquarters R&D operation while also expanding nearby manufacturing centers. That's not charity. The British maker is now racing to stay on top of growing demand. In 2004, the two brands sold just 281,340 vehicles worldwide. Last year, that jumped to 462,678. Land Rover itself handily set an all-time sales record, though Jaguar is still struggling. Consider its decline in the U.S., traditionally its largest market. In 2004, Americans purchased 45,875 Jaguars. Last year, the total was just 15,773—the maker one of the few to post a decline despite the ongoing revival of the American automotive market. It hasn't helped that a number of Jaguar products have grown old and tired. Worse, it hasn't had an entry in the booming compact luxury sedan segment since the plug was pulled on the unloved X-Type. But all that's about to change. The all-new compact model, the XE, will soon begin rolling into showrooms, "one of the most critical products we have introduced in years," says Joe Eberhardt, the new CEO of JLR North America. The sedan model will use a new modular "architecture" that will be shared with a range of other future offerings, including the new F-Space, its first-ever crossover-utility vehicle, as well as the mid-range XF sedan that was unveiled at the 2015 New York International Auto Show. These vehicles are "the culmination of everything the company has learned over the years," contends chief engineer Mike Cross. The new models have already won raves for their design, remembering the era when Jaguar's legendary E-Type was considered the industry's stylistic benchmark. But they also bring to market critical innovations under the hood. For the first time, the maker is offering all-wheel-drive, a must-have these days, especially along the U.S. East Coast and other Snowbelt regions. Jaguar is bringing diesels to the American market to rival German competitors like BMW and Mercedes-Benz. And it is launching an all-new line of efficient, high-performance engines, dubbed Ingenium. To maximize economies of scale, the new power trains are shared with the Land Rover side, as are a variety of other components. That will be critical for a company that produces a fraction of the volume of key luxury rivals. Not that JLR officials are content to remain in the shadows. For now, it's Land Rover showing the strongest momentum, and it's adding plenty of product to keep it building. The launch of the new Land Rover Discovery Sport is key to what will soon become a three-legged product "stool," according to design director Gerry McGovern. The three-row, seven-seat Sport will target buyers who want a mix of off-road capabilities and on-road manners. 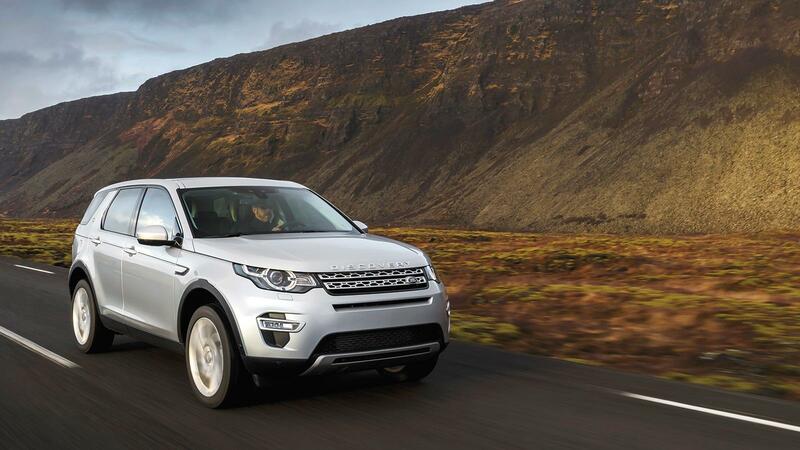 Eventually, there will be several different Discovery models as part of what Land Rover has dubbed its "Leisure Group." The next-generation Defender, considered by many the ultimate in off-roadability, will anchor a second group targeting those who expect to spend serious time hitting the trails. The third, and currently most complete, leg is Land Rover's Premium Group, and consists of the various Range Rover models. The smallest and most stylishly daring is the Evoque, a compact crossover that has become the British maker's all-time best seller. Buyers worldwide purchased more than 125,000 of them last year, nearly as many as the Range Rover and Range Rover Sport models combined. The Premium Group covers some broad territory, from the "base," $42,000 Evoque Pure model, all the way up to the Range Rover Long-Wheelbase Autobiography Black Holland & Holland edition. It not only has one of the longest names ever to wrap around the entire back end of a vehicle, but a price tag to match. Of course, for your $285,000, you get Executive Class reclining seats, electrically deployable walnut tables and even a handmade gun box. The old automotive saw is that only three things matter in the auto industry: product, product and product. So, by that measure, JLR is clearly on the offensive. But, in reality, the two brands have other issues to contend with. Both have traditionally lagged at the back of the pack when it comes to customer service, quality and reliability. But Land Rover has begun to move up the charts. And Jaguar has scored some recent hits. It topped the 2015 J.D. Power Customer Service Index and has been gaining on traditional leaders like Lexus in other measures of quality. The challenge, admits JLR North America chief Joe Eberhardt, will be to get that message across. But as anyone who has spent time in a Land Rover scrambling over boulders or fording streams knows, the brand is more than adept at conquering all obstacles in its way. Along with sibling Jaguar, it has faced plenty of them, but with a wide range of new models, new engines and plenty of high-tech features heading to showrooms over the next few years, Jaguar Land Rover might finally be in position for a smooth ride. Paul A. Eisenstein is publisher of the TheDetroitBureau.com.